4 ingredient Creamy Peanut Butter & Nutella Milkshake. Takes less than 5 minutes to make! Is there a combination better than Chocolate and Peanut Butter? I think not. Peanut Butter and Nutella go so well together. Especially in a milkshake. This Peanut Butter & Nutella Milkshake is creamy, extra thick and fudgy. A quick dessert when you want to satisfy your sweet tooth. This recipe has only 4 ingredients and is so simple to make. Start by picking your favorite vanilla or chocolate ice cream. I used vanilla ice cream in this recipe but you can always go EXTRA chocolate and use chocolate ice cream. Next add in your creamy peanut butter, Nutella, and milk. Blend until you have a nice creamy texture. Make sure to scrape the sides periodically. No ice is added to this milkshake. Ice waters it down and makes it too runny for my taste. Thick and creamy is what I am after. 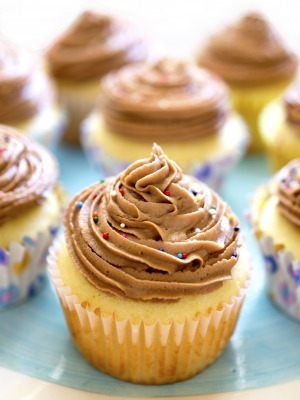 For a fancy twist garnish with whipped cream or a chocolate drizzle. I made my chocolate drizzle with melted chocolate chips and a touch of milk to get the desired consistency. To keep the milkshake cold I like to throw my glasses in the freezer for a couple of minutes. Milkshakes are one of my favorite desserts because they as so quick and easy to make. Serve with a straw or a spoon and dig in! Do you love Nutella as much as I do? Add all of the ingredients to a blender. Blend until milkshake is thick and creamy. Make sure to scrape down the sides. Serve immediately in chilled glasses. Garnish with chocolate sauce if desired. Would it be weird if I made this and drank both servings myself?! I don’t think I’d want to share. 🙂 This milkshake looks and sounds crazy delicious, Kelley! Thanks Ashley! I won’t judge I’ve been known to eat both servings myself. Enjoy! Now THIS is my kind of milkshake. I bought a huge jar of Nutella the other week and I can’t seem to stay away from it. I might have to get my husband to hide it from me haha. Of course! Your blog is beautiful I had fun looking around. I love Nutella too it can be dangerous when there is a large jar around! Thanks! These milkshakes look absolutely perfect. I love nutella, now I need an excuse to go make one of these! Chocolate and peanut butter is definitely the best combination! This milkshake looks fantastic! I’m totally addicted to both peanut butter and nutella, so I can only imagine how delicious it must taste in shake form! Love it! Thank you Gayle! Yes PB and Nutella are awesome together! Oh you amazingly beautiful milkshake, come to me! Thank you Pamela! Hope you enjoy! Great flavor for a milkshake, you can never go wrong with PB & Chocolate! Woah! Nutella AND peanut butter? Yum! Chocolate milkshakes are my fav! This has got to be the best looking four ingredient recipe ever. SO delicious! Milkshakes are awesome. Why do I never make them?! You are absolutely right – there is no better combination than chocolate and peanut butter…except maybe chocolate and peanut butter and Nutella! Your milkshake looks super easy to whip together and definitely would satisfy any sweet tooth! Pinned! Yes milkshakes are the best and super easy! Thanks Lindsey! Wow! This looks sssooo good! I could totally drink this for breakfast. Pinned for later! It’s going to be on the menu! I love desserts like this that are quick and easy to prepare, and these milkshakes look super delicious and easy to adapt for food allergies. Yum! This is drool worthy! Wish it was sitting in front of me right now! Could make this recipe without ice cream because I am allergic to milk? 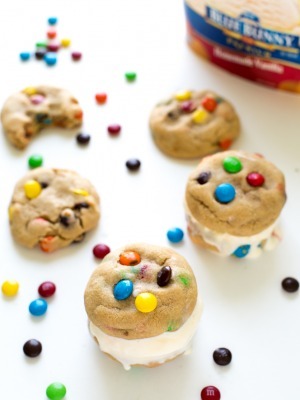 Unfortunately you would have to make this with ice cream because it is the base ingredients. You could substitute soy or almond milk if you are not allergic to those. My girlfriend and I made these to go along with Nutella Mini Donuts! Nutella in the cake donut batter, Nutella in the icing, and these delicious Nutella-Peanut Butter MIlkshakes! The milkshakes were the perfect compliment for the donuts. And sure to be great on their own to continue working through the rest of the Nutella jar. Nutella Mini Doughnuts sound awesome! Glad you liked the milkshake Benjamin! Omg, this was so nice…thanks! These were fantastic! My daughter and I had milk shake cravings tonight and as it was our luck we came across your recipe. They were so easy to make and these ingredients are always stocked in our house. Thanks for the great recipe. So glad you and your daughter loved them Rebecca!! Thank you!